D. Increased media coverage in magazines and other relevant publications is needed to get the word out about Australian grown wildflower products and how to use and enjoy them. Our current marketing strategy for the domestic market has been to address the needs listed above, on an ongoing basis. The first thing tackled has been the knowledge base of our Australian floral supply chain -- many florists are unaware of the exciting range of wildflower and foliage products available to them, how to care for them to get the best vase life, or how to use them in floral design. 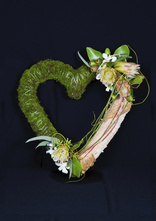 The annual national student floristry competition hosted by WildFlowers Australia is an important strategy as it promotes wildflower products to the florists of tomorrow, encouraging them to include them in their designs. Another project ensured that the new floristry training package, launched in 2010 by Service Skills Australia, now includes complete information on wildflowers as part of the compulsory section of the curriculum. a. Posting key seasonal information on websites that are visited by florists. b. Publishing detailed listings of seasonal flowers as well as highlights on 6 – 8 products each Spring, Summer, Autumn and Winter in the quarterly Interflora magazine ‘In Focus’. This received a great response from the Interflora members. c. Publishing seasonal listings in the Australian Flower Industry magazine. d. Getting articles on wildflowers published in main stream glossy magazines. The above actions have aimed to educate members of the supply chain – thereby increasing the potential sales for flowers in general. Although wildflowers have been the focal point of this campaign, we are aiming to increase consumption of all flowers by the Australian domestic market, and 'What cut flower is that?' is an important resource to support this goal.